Say you were trying to help people lose weight, prep for a surgery or take their meds every day. They’re probably holding a smartphone in at least one of their hands — all you need to do is enlist that ever-present device they’re staring at to bug them! 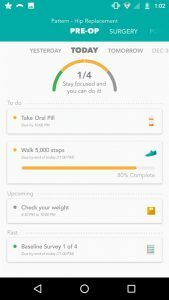 This is a screenshot of a Pattern Health app for pre-operative patients. It’s even possible to make them pinky-swear a promise to their phone that they will do something positive toward the goal, like walking or skipping desert that day. And if they don’t? The app has their permission to lock them out of all their apps for a period of time. Seriously, people agree to this and it works. 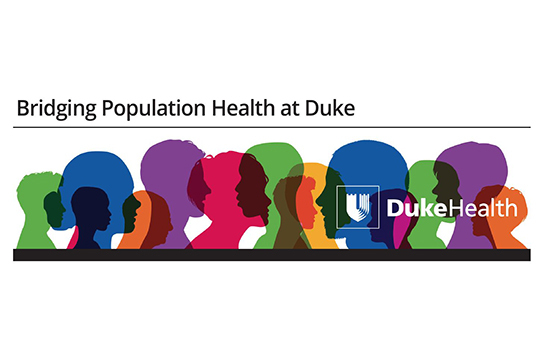 Two app developers on this frontier of personalized, portable “mHealth” told a lunchtime session sponsored by the Duke Mobile App Gateway on Thursday that patients not only willingly play along with these behavioral modification apps, their behaviors change for the better. The idea of using phones for health behavior came to pediatric hematologist Nirmish Shah MD one day while he attempted to talk to a 16-year-old sickle cell disease patient as she snapped selfies of herself with the doctor. Her mom and toddler sister nearby both had their noses to screens as well. “I need to change how I do this,” Shah thought to himself. 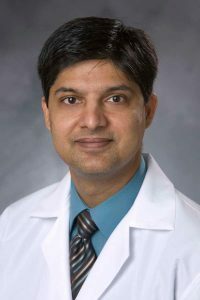 Pediatric hematologist Nirmish Shah MD is director of Duke’s sickle cell transition program. 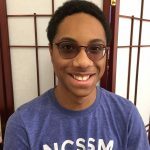 Twenty health apps later, he’s running phase II clinical trials of phone-based interventions for young sickle cell patients that encourage them to stay on their medication schedule and ask them often about their pain levels. One tactic that seems to work pretty well is to ask his patients to send in selfie videos as they take their meds each day. The catch? The female patients send a minute or so of chatty footage a day. The teenage boys average 13 seconds, and they’re grumpy about it. Clearly, different activities may be needed for different patient populations, Shah said. While it’s still early days for these approaches, we do have a lot of behavioral science on what could help, said Aline Holzwarth, a principal of the Center for Advanced Hindsight and head of behavioral science for a Durham health app startup called Pattern Health. Aline Holzwarth is a principal in the Center for Advanced Hindsight. “It’s not enough to simply inform people to eat better,” Holzwarth said. The app has to secure a commitment from the user, make them set small goals and then ask how they did, enlist the help of social pressures, and then dole out rewards and punishments as needed. Pattern Health’s app says “You need to do this, please pick a time when you will.” Followed by a reward or a consequence. 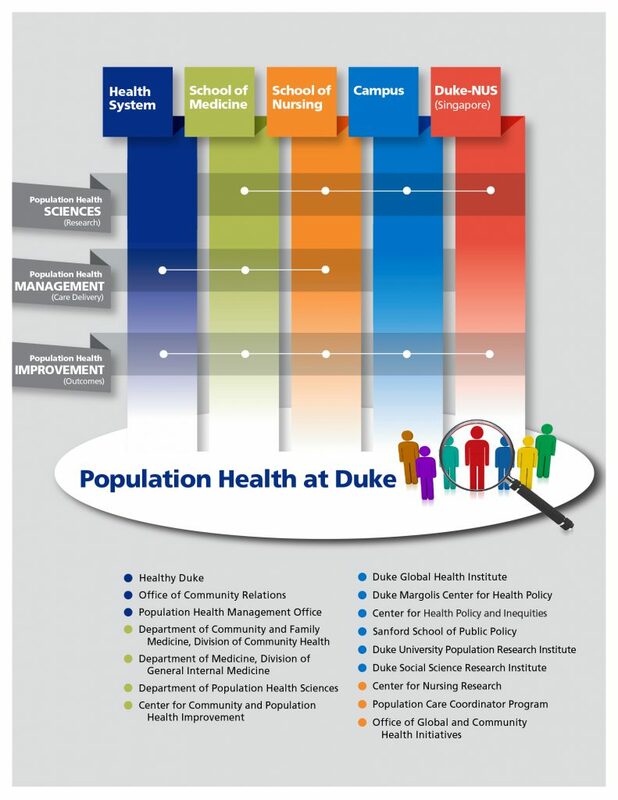 Thursday’s session, “Using Behavioral Science to Drive Digital Health Engagement and Outcomes, was the penultimate session of the annual Duke Digital Health Week. Except for the Hurricane Florence washout on Monday, the week has been a tremendous success this year, said Katie McMillan, the associate director of the App Gateway. 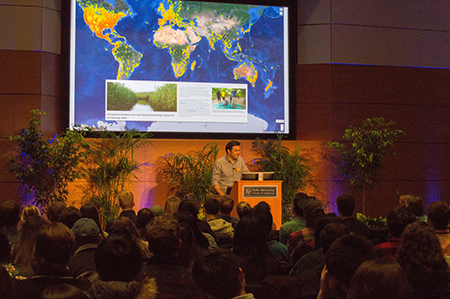 In the first week of February, students, experts and conservationists from across the country were brought together for the second annual Duke Blueprint symposium. 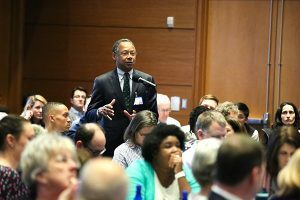 Focused around the theme of “Nature and Progress,” this conference hoped to harness the power of diversity and interdisciplinary collaboration to develop solutions to some of the world’s most pressing environmental challenges. 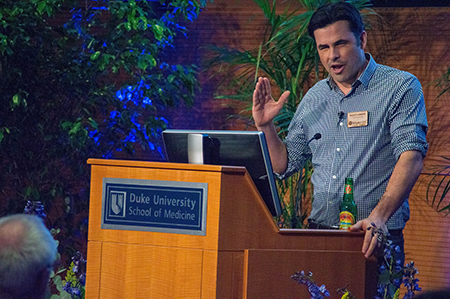 Scott Loarie spoke at Duke’s Mary Duke Biddle Trent Semans Center. One of the most exciting parts of this symposium’s first night was without a doubt its all-star cast of keynote speakers. The experiences and advice each of these researchers had to offer were far too diverse for any single blog post to capture, but one particularly interesting presentation (full video below) was that of National Geographic fellow Scott Loarie—co-director of the game-changing iNaturalist app. iNat, as Loarie explained, is a collaborative citizen scientist network with aspirations of developing a comprehensive mapping of all terrestrial life. Any time they go outside, users of this app can photograph and upload pictures of any wildlife they encounter. A network of scientists and experts from around the world then helps the users identify their finds, generating data points on an interactive, user-generated map of various species’ ranges. Simple, right? 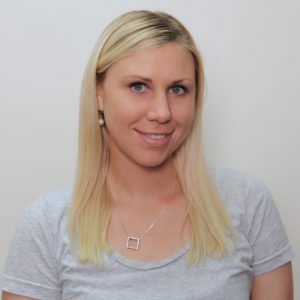 Multiply that by 500,000 users worldwide, though, and it’s easy to see why researchers like Loarie are excited by the possibilities an app like this can offer. The software first went live in 2008, and since then its user base has roughly doubled each year. This has meant the generation of over 8 million data points of 150,000 different species, including one-third of all known vertebrate species and 40% of all known species of mammal. Every day, the app catalogues around 15 new species. “We’re slowly ticking away at the tree of life,” Loarie said. Through iNaturalist, researchers are able to analyze and connect to data in ways never before thought possible. Changes to environments and species’ distributions can be observed or modeled in real time and with unheard-of collaborative opportunities. To demonstrate the power of this connectedness, Loarie recalled one instance of a citizen scientist in Vietnam who took a picture of a snail. This species had never been captured, never been photographed, hadn’t been observed in over a century. One of iNat’s users recognized it anyway. How? He’d seen it in one of the journals from Captain James Cook’s 18th-century voyage to circumnavigate the globe. It’s this kind of interconnectivity that demonstrates not just the potential of apps like iNaturalist, but also the power of collaboration and the possibilities symposia like Duke Blueprint offer. Bridging gaps, tearing down boundaries, building up bonds—these are the heart of conservationism’s future. Nature and Progress, working together, pulling us forward into a brighter world. 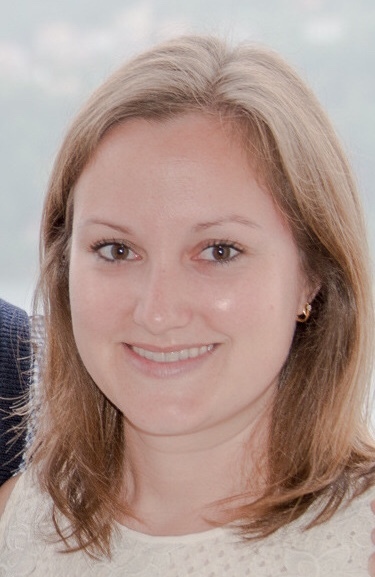 Jessica West is a PhD candidate in sociology. Jessica West, a PhD student in sociology at Duke, has found that hearing loss creates chronic stress but that high levels of social support – from family, friends and others – can help alleviate depression. Given that hearing loss is a growing social and physical health problem, her study suggests a need for increased vigilance regarding hearing loss among older adults, West said. Her study was published in the November issue of Social Science & Medicine and is available here. Here, West discusses her research. Your research examines the correlation between hearing loss and depression. That seems a logical connection: why study it in the way you did? Despite how common hearing loss is, it is actually quite understudied. A handful of studies have looked at the relationship between hearing loss and mental health over time, but the results from these studies are mixed: some find a relationship between hearing loss and more depressive symptoms, while others do not. On top of the mixed findings, most studies have been based overseas, and studies based in the U.S. have tended to use state-specific datasets, like the Alameda County Study, which drew from Oakland and Berkeley, CA. I use the Health and Retirement Study, which is nationally representative of adults aged 50 and older in the U.S., and therefore more generalizable to the U.S. population. I frame hearing loss as a physical health stressor that can impact mental health, and that social support can alter this relationship by preventing a person from experiencing stress or reducing the severity of a reaction to it. To the best of my knowledge, this is the first paper to link hearing loss to health outcomes in this way. What might surprise people about your findings? More than one-fifth of the people in my sample have fair to poor hearing (23.12% or 1,405 people in the first wave). Hearing loss is really common in the U.S.
Also, I found that social support is most beneficial in easing the burden of hearing loss among people with significant hearing loss. Overall, this suggests that hearing loss is a chronic stressor in people’s lives and that responses to this stressor will vary by the level of social resources that people have available to them. What does ‘social support’ mean in real terms? What can the family and friends do for a person with hearing loss to help them? For people with hearing loss, it’s important that they feel able to lean on, talk to, and rely on family, friends, spouses or partners, and children. And going a step further, people with hearing loss need to know that these important people in their lives truly understand the struggles they face. What this means is that people with hearing loss can benefit quite a lot from having a network of people that they feel comfortable discussing things with or reaching out to when needed. Do people with hearing loss have adequate mental health resources or care available to them? My research shows that social support is really important for people with hearing loss. One suggestion I make in my paper is that audiologic – or hearing — rehabilitation programs could include educational training for significant others, like spouses or friends, to emphasize the importance of supporting people with hearing impairment. Audiologists, primary care physicians, family, and friends are all key resources that could be targeted in such rehabilitation programs. What is your next project related to hearing loss? I am currently working on several projects related to hearing loss. In one, I am looking at the relationship between an individual’s hearing loss and his/her spouse’s mental health outcomes. Few population-based studies have examined the relationship between hearing loss and spousal mental health longitudinally, so I hope this study will shed light on the experience of spousal disability within marriages. Another project I am working on looks at hearing loss from a life course perspective. In other words, I am looking at people who self-reported hearing loss before the age of 16 and seeing how their hearing loss influenced their marriages, academics and careers. A better understanding of how early life hearing loss influences later life outcomes has implications for earlier identification of hearing loss and/or the use of assistive technology to help people remain socially, academically, and economically engaged. CITATION: West, Jessica S. 2017. “Hearing Impairment, Social Support, and Depressive Symptoms among U.S. Adults: A Test of the Stress Process Paradigm.” Social Science & Medicine 192(Supplement C):94-101. 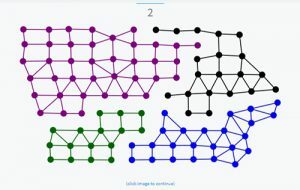 What began as an undergraduate project looking at how to create a “typical” map of congressional districts expanded to a national investigation for Duke mathematics chair Jonathan Mattingly. 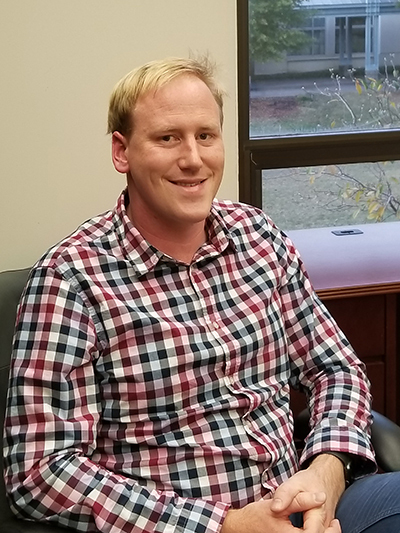 He was generous enough to speak to me about some of his recent work in mathematically investigating gerrymandering and the communication which followed between lawmakers and statisticians. By strategically manipulating certain lines, it is possible to ensure a certain number of seats for one party even if that party does not win the majority vote. What “Team Gerrymandering” set out to do was to create an algorithm which would create the least biased map possible. The use of the term “fair” is complex in this instance, as politics and geography are very rarely simple enough to be split fairly. An example of a mathematical model of precincts and districts. In Wisconsin, the algorithm which “Team Gerrymandering” developed was used to prove that the voting districts were being disproportionately drawn in favor of the Republican votes, a trend which had was also been seen after the 2015 elections in North Carolina districts. The algorithm developed was then submitted as an brief amicus curae brief and used (it was used as a piece of appellate evidence) in the Wisconsin case Whitford vs. Bill. case. The mathematicians hoped to , in an attempt to prove that the districting of Wisconsin is an outlier in comparison to thousands of other mapping simulations run under their algorithm, which provide statistically sound data. A problem such as this is a prime example of the bridge between the Humanities and STEM fields, which become increasingly separate as the level of expertise rises. as this truly bridges the humanities and STEM fields:, a solution has been found, but effectively communicating it was not as simple. 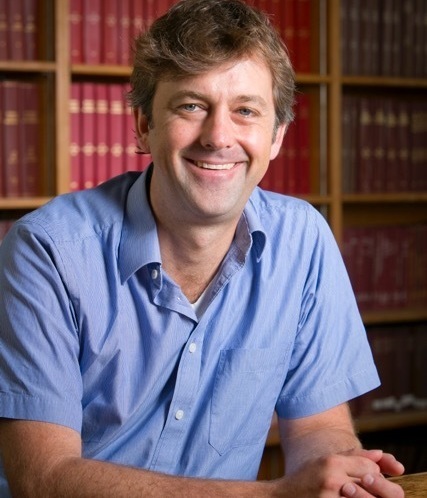 When asked about explaining and publishing this work in order to submit it as evidence, Mattingly admitted that it was, at times difficult, but it only further proved how important the effort is. A team full of lawyers looking to win a case is arguably a highly motivated audience, but this is not always the case. Mattingly, who is a 1988 graduate of the NC School of Science and Math which I attend, mentioned being at parties and hearing people state, “Oh, I’m no good at math, it’s just numbers and letters to me,” but he could never recount anyone saying “Oh, I don’t see the point in using language, or reading a dictionary.” These may seem like harmless comments, but a subconscious form of selective ignorance is still selective ignorance. The results of the Whitman vs Gill case are expected in June of 2018, and until then, the conversation must continue. UPDATE: On Jan. 9, a federal court panel struck down North Carolina’s Congressional district maps on the grounds that they had been gerrymandered to favor Republicans. Mattingly commented. Six-year-old Beatriz glanced back up at her father and then towards the new life ahead of her. She would remember this moment in all of her years to come. 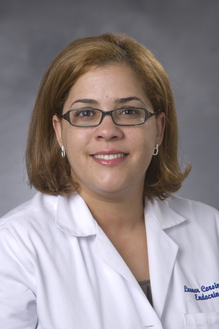 Beatriz Morris, MD, practices pediatric medicine in English and Spanish at Duke Children’s Primary Care near the Southpoint Mall. Beatriz and her family immigrated to the United States from Cuba seeking religious freedom and an escape from communism with nothing more than the clothes on their backs. Beatriz’s father instilled a lesson in her that day which she now sees as a life philosophy. She prioritizes learning, for it is the one thing no one else has power over. 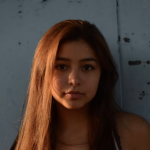 Learning English at the age of six was not a hard task for Beatriz, and she is still bilingual. Today, she is Dr. Beatriz Morris, practicing pediatric medicine at Duke Children’s Primary Care near the Southpoint Mall. She completed her residency at Emory University and has been in practice for over 20 years, but never imagined she would be walking the path that she is today. Dr. Morris went to undergraduate school intending to pursue art, with a specific career goal in mind – to illustrate medical textbooks. 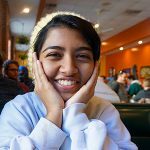 To meet the requirements for a medical illustration major in graduate school, she ended up receiving enough credits in both art and science to double major for her bachelor’s degree. But in applying to illustration school, she never could have predicted what happened next. From there on out, Dr. Morris never looked back. She has been practicing in pediatrics for over twenty years, embracing both her Hispanic and American heritages. 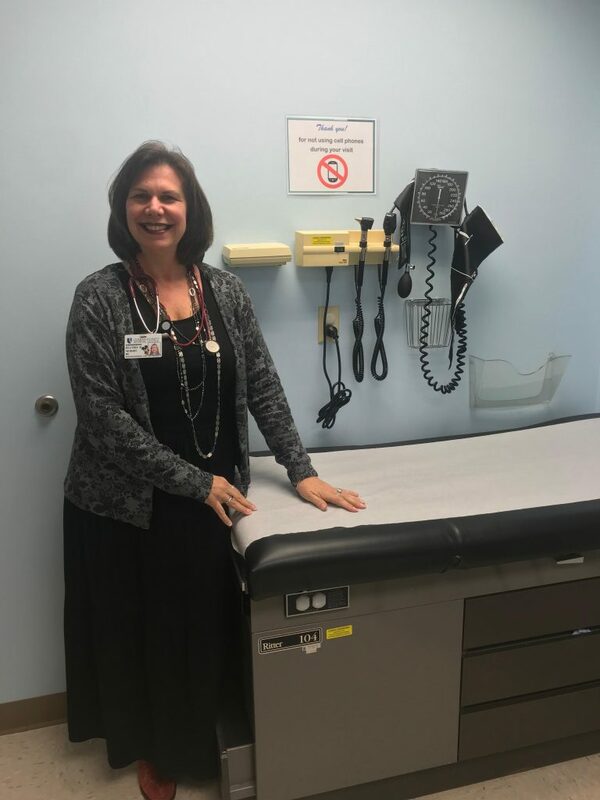 Speaking both Spanish and English allows Dr. Morris to make her patients comfortable by not only knowing their languages, but also having a deep understanding of both cultures. Dr. Morris wakes up every day excited to do her job. She reflected on the moment when she knew that pediatrics was the specialty she was meant to work in. On her internship rotation, Dr. Morris spoke to a nurse, who then told her that she would make a great pediatrician. Her advice to those looking for a lifelong fulfilling career is best described by how you feel waking up in the morning. Is waking up to go to work dreadful, or are you opening your eyes happy, knowing that you have the privilege to do what you love for another day? “Don’t do something because it will be easy, for money, or because your parents tell you to,” she advised. “Do something because it is in your heart. If they close the door on you, open the window,” Dr. Morris said. Most people don’t see in ferns the glory and grandeur of the mighty angiosperms — the flowering plants — but to those who can, ferns may seem like the only thing you could spend your time researching. 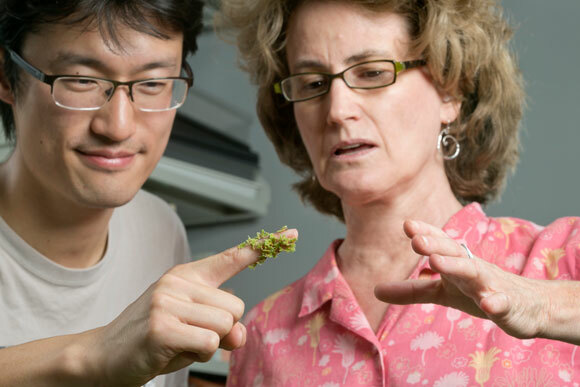 Kathleen Pryer, a professor of biology at Duke, is an example of one of these people who found their calling in ferns. But she didn’t know it would be ferns from the beginning. As an undergraduate, she had thought she wanted to be an animal behaviorist, having read books by Jane Goodall, so she enrolled in McGill University in Montreal (she’s Canadian by the way) in the animal behavior program and didn’t end up taking a single botany course until her senior year. For her final project she worked with snails, a starkly slow endeavor, she thought. Slower even than ferns. 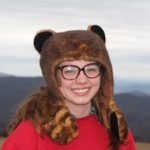 After getting her degree in animal behavior, she decided she wanted a masters working with plants, but before jumping right in with only one class’ worth of experience with plants, she worked as a technician for a budding ecologist. While working there, the ecologist’s wife, who did her masters on ferns, took her on a trip to the annual meeting of the botanical society of America in Blacksburg, VA, a 13-hour trip. In Virginia, she went on a 2-day field trip through Virginia, led by fern expert Warren Wagner, finding ferns with 107 other people who were mad about ferns. After that, the idea of ferns stuck, and she’s been working with them ever since. She’s gotten the chance to name or rename many species of fern, and she created the genus Gaga, named after the singer. Another new genus she found is soon to be named Mandela by her as well; a nice change from the usual names of “old white guys,” given to new genera, she said. Through it all though, Pryer is most proud of a paper from 2001, which showed that all modern ferns originated from a central progenitor, showing that they aren’t as archaic as most people think. That paper made the cover of Nature, and has been cited hundreds of times since. In the end, I guess it’s really hard to tell where you’ll end up. If an aspiring animal behaviorist can jump to the world of ferns and make a successful career out of it, surely there’s hope for the rest of us too. In the end, all that matters is if you’re doing what you love, and as for Kathleen Pryer, she’ll keep doing what she loves as long as there’s a “chair and a microscope” for her to sit at. Dr. Leonor Corsino works to relieve the prevalent issues regarding diabetes and obesity. 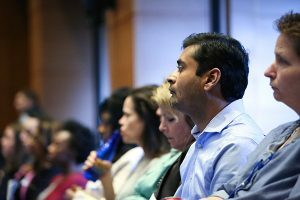 An endocrinologist and professor at the Duke School of Medicine, her passions lie in understanding the struggles that diabetics face through comprehensive patient care and communication. Her interests in endocrinology began at a young age. 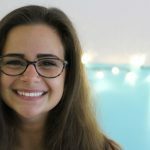 She grew up watching her father and many other members of her family challenged with balancing a normal life alongside diabetes. When she progressed to medical school, she was fascinated by the workings of the hormonal system, one of the most neatly regulated of all the biological systems. “When it works in harmony, everything is perfect, but when something goes off, it affects many other organs,” she says. Another factor that plays a role in providing good patient care is the amount of time available to treat each person, according to Corsino. Although Corsino always aspires to treat her patients to the best of her abilities, occasionally, the limited time she has with each individual can impose difficulties with empathizing and treating patients. However, many regular patients don’t mind when their appointments are delayed because they know that they will receive better care when they are able to get her undivided attention. Corsino has found that biological factors play an equal role to environmental factors in the risk of getting diabetes. Sometimes, even if a patient strictly adheres to the prescribed treatment, they still don’t see the same results and progress as others do. This distinction can be attributed to things like differences in fat distribution and insulin resistance. In her work, Dr. Corsino tries to alleviate the stress and difficulties that those with diabetes and obesity encounter. As a doctor and professor, she inspires others to pursue a career in public health and provide healthcare to those who need it. We know less about the ocean floor than the surface of the moon. As one of the most unexplored areas of the world, multiple companies have begun to incentivize ingenuity towards exploring the oceans. Among these organizations are the Gates Foundation, the National Academy of Sciences, and X Prize. 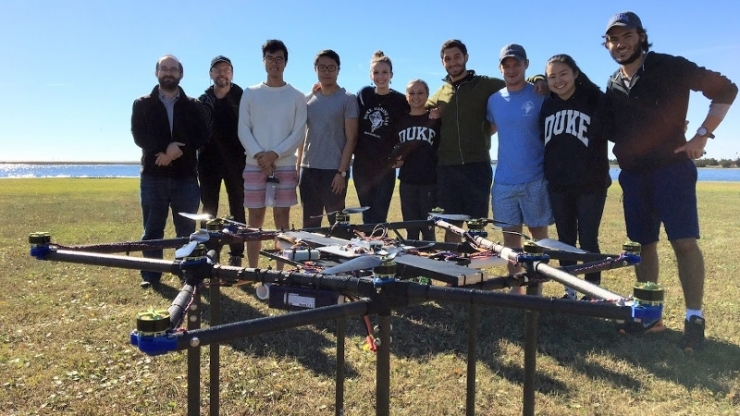 Martin Brooke, second from left, and the student team with their giant drone. 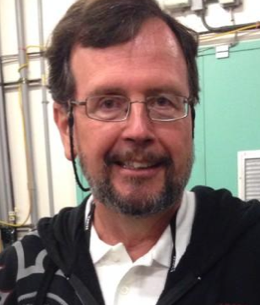 Martin Brooke, an Associate Professor of Electrical and Computer Engineering at Duke, is presently leading a group of students who are working on mapping the ocean floor in an efficient way for the X Prize challenge. Brooke said “open ended problems where you don’t know what to do” inspire him to do research about ocean engineering and design. 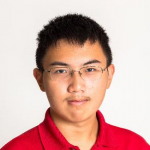 Before working on a drone that drops sensor pods down into the ocean to map the ocean floor, Brooke and his students built a sensor that could be in the ocean for a month or more and take pH readings every five seconds for a previous X Prize challenge. Addressing the issues that many fisheries faced, he told me that he met an oyster farmer in Seattle who wished that there were pH sensors in the bay because sometimes tides bring in “waves of high pH water into the sound and kill all of the oysters without warning.” Citing climate change as the cause for this rise in pH, Brooke explained how increased carbon dioxide in the air dissolves into the water and raises the acidity. Emphasizing how “there’s not enough data on it,” it’s clear that knowing more about our oceans is beneficial economically and ecologically.